Marketers are flocking to Instagram. The site offers the highest engagement rate of any social network and marketers want to cash in on that highly engaged audience. Engagement on Instagram has grown 108% in Q1 of 2015 compared to Q1 2014 and continues to rise. So why does Instagram see such high engagement rates when compared with the others? Let’s take a look and find out. Pictures are a clear winner when it comes to social engagement. They increase Twitter retweets by 35% and Facebook photo posts gather 53% more likes than the average post. Aside from the type of medium Instagram offers (photos, plus video to a lesser extent), what leads to their sky high engagement levels? Instagram users have a high potential to see every post from the accounts they follow. Facebook’s news feed algorithm shows members the posts they’re most likely to want to engage with (otherwise they’d have more than 1,500 posts a day to sort through). Twitter posts move at such a rapid pace that it can be hard to keep up even if you are actively watching (unless you follow a very small number of users). Instagram doesn’t currently have any type of algorithm pulling back posts from the eyes of followers. The average number of posts per day is also lower on Instagram, making it easier for your photos to be seen. The average enterprise business posts 4 times a day to Twitter and once to Facebook. Instagram sees an average of less than 1 post per day from most accounts. With less competition for screen time, the opportunity to be seen increases. With users seeing everything you post, the chances for engagement are far higher. Instagram keeps it simple. You can ‘Like’ a photo or comment on it, and that’s it. There is no share or retweet option (these actions are also much more difficult to get users to do as they’re seen as an endorsement to your own followers that you support whatever you’re sharing). The required action to engage is as simply as double-tapping a photo and scrolling on to the next one. It’s a fairly low-level engagement that doesn’t require much of a commitment as one can give out as many as they like and most others will never be aware of it. The engagement action of liking is so simple that users don’t even have to slow down much while scrolling through their feed to execute (do they really like what they see if they can’t even be bothered to stop?). And comments are kept pretty simple too. While there are certainly pictures and accounts that see great feedback on their photos, the majority of comments on Instagram are fairly simple also. Emojis and simple “Awesome.” comments seem to be the best most photos receive. By making it super simple to engage and having the cost of engagement be very little, Instagram helps to further increase engagement levels on the platform. With high engagement levels on Instagram, it can be easy to wonder what an engagement is worth. People pass out ‘Likes’ more than candy on Halloween it seems. 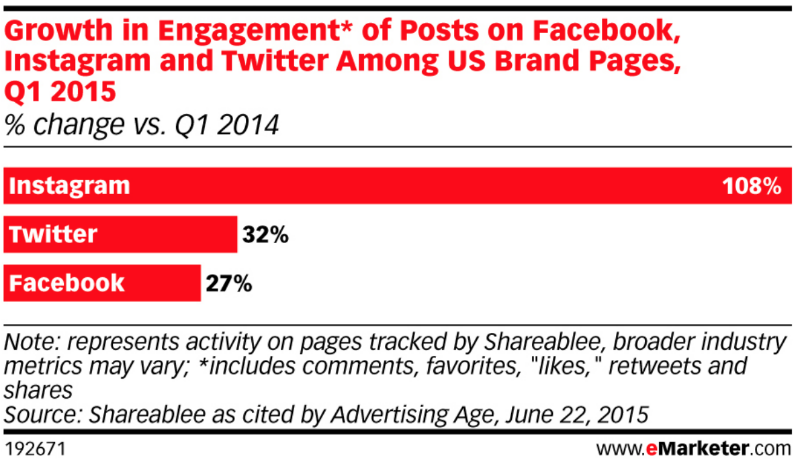 For each company on Instagram the value of those engagements will differ. While some companies will see the value in engaging with the fans in any way, others won’t value these interactions so highly unless they drive people to their website or get them to buy a product directly. It’s really a matter of figuring out what it’s worth to you. Understanding how each social network performs and the psychology of social across different platforms can help to direct social strategy. Knowing why Instagram is likely to have engagement rates greater than other networks helps us to better understand user behavior and how we can harness it to gain social success. Now go out and grab those ‘Likes’.